I visited a family friend a while ago and I noticed this book on her desk. Since we recently "adopted" a cat, the book's cover immediatelly grabbed my attention. I asked her what it was about and she told me that it contained various stories about cats that changed their owner's lives. After a brief conversation, I came to find that this was actually Vicki Myron's second book about Dewey and that the first one was about his story and how he affected Vicki's life and various others at the Spencer Public Library. Even though I haven't read the first book, my friend generously lent me this one to read. The book changed my perspective about cats and brought me closer to my own. It taught me that every cat has his/her own personality and just because yours doesn't like water, doesn't mean your neighbour's cat doesn't either. It definitely made me realise that cats aren't much different from us and are just as good as a best friend as a dog. You also get to read about real life stories and, if like me, you haven't read the first book, then it's okay because the author talks about Dewey's story too inbetween. I recommend this to every cat lover/owner. 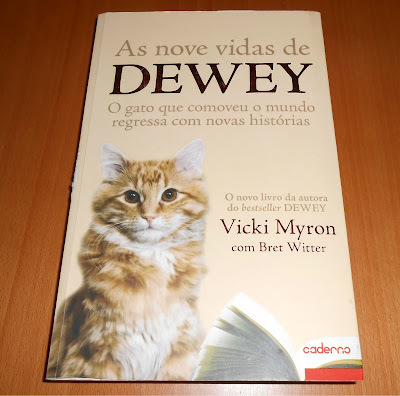 If you want to look for it, the original title is 'Dewey's Nine Lives: The Legacy of the Small-Town Library Cat Who Inspired Millions' and the first one is 'Dewey - The Small-Town Library Cat Who Touched the World'. Hopefully I'll get to read the first book in the future as I really would like to know more about Dewey.